SIR CECIL A COCHRANE is an 0-4-0ST with 12 x 20″ outside cylinders, 3ft 1in diameter driving wheels and weighs 21 Tons. She was built by Robert Stephenson & Hawthorns Newcastle Works, with works number 7409 and was ex-works on 27/7/1948. Named SIR CECIL A COCHRANE, she was new to Newcastle upon Tyne & Gateshead Gas Co, Redheugh Gas Works, Gateshead. The works owners were the Northern Gas Board from 1/1949 and in 1953 she was registered by the Railway Executive to operate over British Railways track in the exchange sidings and given the reference number 1795. On 26/6/1971 she was bought by the Stephenson & Hawthorns Locomotive Trust and stored at the National Coal Board shed at Backworth, Northumberland. She moved to Marley Hill in 8/1975 and has been in regular use ever since. During this time, SIR CECIL A COCHRANE has undergone a number of 10 Yearly overhauls, and has the distinction of being the first Standard Gauge steam locomotive to receive a new boiler in preservation; this is an all-welded boiler (which she carries to this day) and was constructed by Winson Engineering in 1998. As is customary, SIR CECIL A COCHRANE was overhauled again in 2008, in a speedy process that took less than four months to complete. Since 2008, Cochrane has been in regular use on the railway and was also loaned to Beamish Museum from August to September 2010 (following shortly after a similar visit by fellow Tanfield Railway resident RENISHAW IRONWORKS NO.6) in order to operate their passenger service for a while. From September 2010 to June 2011, SIR CECIL A COCHRANE made only four working appearances before returning to full service in June 2011, following a full boiler re-tube. 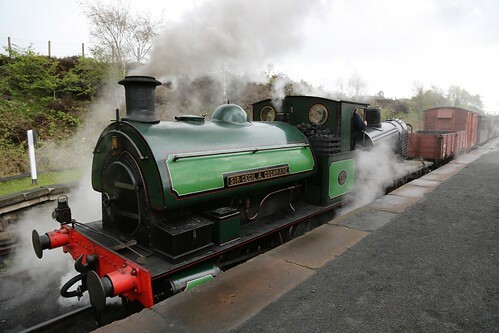 SIR CECIL A COCHRANE can currently be found in regular service on the railway and, when not out on the line, can be viewed in Marley Hill Shed.